Best new place to eat in Durham for a healthy, delicious lunch or dinner. This super casual poke place opened a few months ago on Ninth Street in downtown Durham and I love it! The poke concept is basically a deconstructed sushi roll served in a bowl with a variety of toppings. 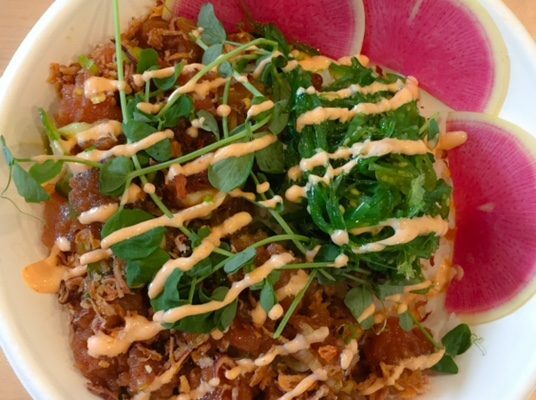 Originally from Hawaii poke is the healthiest game in town. It is simply this; a bowl of steamed rice ( they also have quinoa as an option) topped with chopped raw or slightly marinated fish ( tuna, salmon, scallops and shrimp are the options), scallions, mango, sesame seeds, sprouts, jalapeños, cilantro and then a squirt of sriracha aioli. All the toppings are optional and it’s a pick as you go assembly line deal where you lookout the items and chose your own bowl. They offer salad greens or zucchini noodles as a base as well for those carb free people. It’s healthy and yummy and for about $12 you have a satisfying quick meal. I am a fan and will be bringing multiple friends in to try something new. Thank you ZenFish!